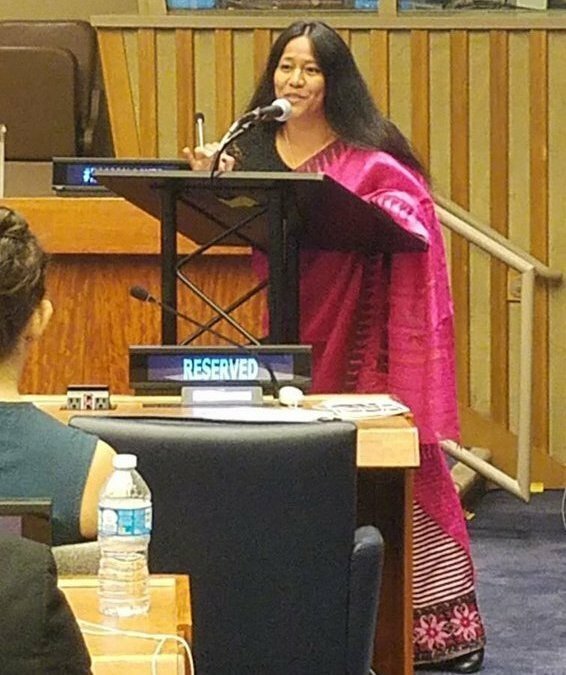 Manipur born, renowned writer, social activist, Ms Binalakshmi Nepram spoke at Plenary Session on 1 August 2017 at United Nations Headquarters in New York on Inter-generational Dialogue on Sustainable Development Goals. 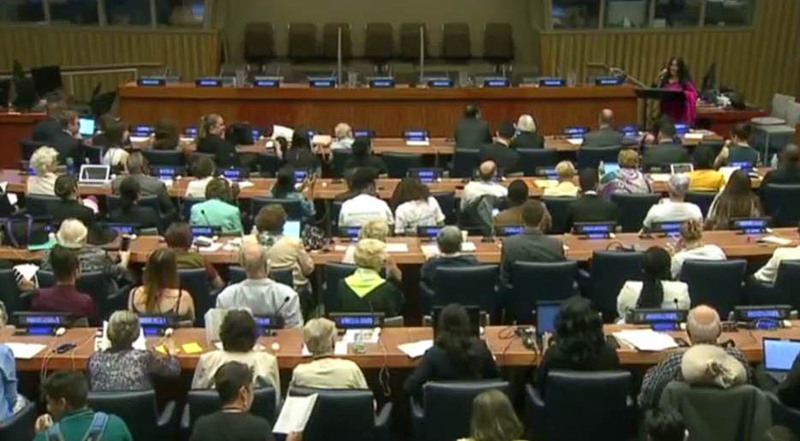 Governments and people & NGOs from different walks of life numbering over 500 gathered at this important event held at UN HQ. Addressing the gathering Ms Binalakshmi Nepram covered Manipur’s history and its ongoing violence and explained to the audience how Manipur Women Gun Survivors Network was set up to help empower lives of women survivors of violence in true spirit of UN's Sustainable Development Goals. Speaking on the occasion, Ms Nepram said that Manipur and Northeast India is home to 45 million people belonging to 272 ethnic groups and speaking over 400 languages and the need to include indigenous peoples everywhere in world, women human rights defenders & ensure women in decision making and those who work on peace and disarmament to be a part of the process. She also stressed on how $1 trillion is spent on the armament industry, and mindfully highlighted that if 10 percent of that military spending can be used to achieve the Sustainable Development Goals by 2030. In a statement issued, Ms Nepram states, “We are living in times of violence not just in Manipur, or Northeast India but in the entire world. This has huge humanitarian consequences especially on the lives of women and children.” She also despondently shared how violence destroys lives, communities, and our future. During her speech, she mentioned her gratitude to the United Nations and reminded everyone with a powerful note that the SDG’s cannot be a 9 to 5 job but a movement. The purpose of the United Nations Inter-generational Dialogue on Sustainable Development Goals was to raise awareness of the high value that youth and older persons can bring to implementation of the SDGs, and foster a shift in the perception of youth and older persons from beneficiaries of social policy to agents of social change. Building on existing efforts, the event was an important opportunity to mobilize civil society with the objective of leaving no one behind. She received a standing ovation for her speech at UN which lasted almost 7 minutes. Other panelist who also spoke at plenary include President of UN General Assembly and Youth Envoy to United Nations. 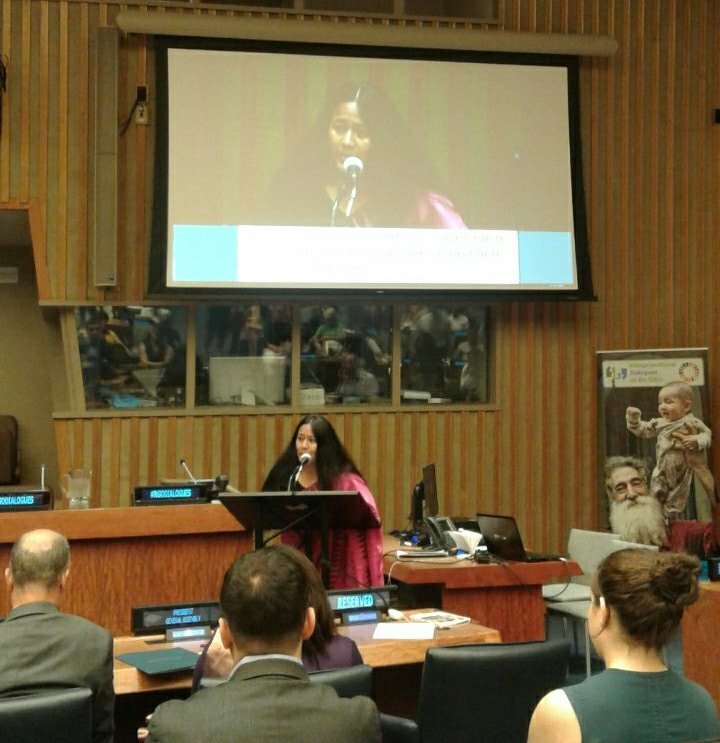 Ms Binalakshmi Nepram also recently participated at High level political forum on SDGs; she is also working closely with various stakeholders in the country and at a global level to ensure achievement of SDGs by 2030. The Sustainable Development Goals (SDGs) were adopted by United Nations (UN) Member States in September 2015 to end poverty, protect the planet, and ensure human rights and prosperous and fulfilling lives for all by 2030. 193 countries have adopted the SDG’s.